I’ve been listening to my favorite book this week, C.S. Lewis’ Till We Have Faces. Its one of those books that sneaks up on you. You can get 2/3 through it – perhaps even 3/4 – and still be thinking, “whats all the fuss about this book?” But then at the end everything comes crashing down on you, and you never look at the world in the same way again. Its quite an experience. I didn’t know how much a story could move or teach me until I read this one. And now I keep seeing new levels of truth in it as I re-read it over the years. This time I listened to the book particularly with a view to what I see as its great theme, namely, the exposure of false, possessive love – that is, needy love, thirsty love, love which takes rather than gives, love which desires the other person for one’s own happiness rather than the other person’s happiness in itself. As I made my way through the story with this theme in mind, all kinds of things stood out to me, confirming and enlarging it in my mind. The evidence for it is everywhere – perhaps most clearly in Orual’s actual complaint to the gods at the end of Book II, chapter 3, where (for example) she insists, “she was mine. Mine. Do you not know what the words means? Mine!” (p. 292 of my Harvest 1984 copy). But what I didn’t expect, and had never before noticed, was how Lewis highlights Orual’s false love by contrasting it with the true, giving, sacrificing love of other characters in the book. The Fox, for example, after realizing that he shouldn’t use his love to beg Orual to avoid fighting Argon, repents and says, “I was wrong to weep and beg and try to force you by your love. Love is not a thing to be so used” (204). Or when Unsit responds to Orual’s suggestion that she could have forced Bardia to stay home with indignation: “keep him to myself at all cost? Make him so mine that he was no longer his? … Queen Orual, I begin to think you know nothing of love…. Perhaps you who spring from the gods love like the gods. Like the Shadowbrute. They say the loving and the devouring are all the one, aren’t they?” (264-265). Even Orual herself realizes that ugliness of her love for Bardia, so that her later self contrasts with her earlier self: “my love for Bardia (not Bardia himself) had become to me a sickening thing. I had been dragged up and out onto such heights and precipices of truth, that I came into an air where it could not live. It stank; a gnawing greed for one to whom I could give nothing, of whom I craved all” (267). I would therefore say that what Lewis is doing is more than just deconstructing false love. He is also showing, by contrast, the beauty of true love, sacrificial, pure love. I love when Orual bows down at Psyche’s feet at the end of the book and says, “never again will I call you mine, but all there is of me shall be yours” (305). 1) The growing distinction between the real Orual and Orual the Queen after her great wound in breaking with Psyche. This is so vividly communicated at the end of chapter 19, when Orual is drunk from the feast after killing Argan, and (writing somewhat drunkenly) says: “I am a great queen. I have killed a man. I am drunk like a man…. The King’s dead. He’ll never pull my hair again. A straight thrust and then a cut in the leg. That would have killed him. I’m the Queen; I’ll kill Orual too.” Or there’s the metaphor of reverse pregnancy on p. 226: “During [many years] the Queen of Glome had more and more part in me and Orual had less and less. I locked Orual up or laid her asleep as best I could somewhere deep down inside me; she lay curled there. It was like being with child, but reversed; the thing I carried in me grew slowly smaller and less alive.” Orual’s response to her wound is to fill her life the duties of her Queenship – to kill and conquer and command. And she does so with amazing success – advancing the kingdom of Glome beyond what could have ever dreamed. But it doesn’t heal the wound inside of her. It merely distracts her from it. Many people achieve and accomplish much in the world out of reaction to an internal wound – a father wound, a romance wound, a betrayal wound, an identity wound. They are driven – hauntingly, relentlessly – by some defining painful experience, which everything else in their life becomes defined by. And how much has been achieved in the world by this drivenness! Kingdoms conquered, empires built, dragons slayed, mountains climbed. But no matter much is achieved, its never enough. You can conquer the whole world, but it won’t fix things. It won’t fill the emptiness inside, it won’t cure the ache, it won’t give you an identity. Its not where the answers are. As at the end of the book when the Queen has built this massive kingdom and yet not progressed one inch towards healing the wound inside. And thus at the end un-queened Orual emerges again and all her accomplishment is unraveled and means nothing. In other words, its possible to be great in the eyes of the world, and yet have a massive, gaping hole in the middle of your life. As Orual describes herself at her lowest point: “it was as if my whole soul had been one tooth and now that tooth was drawn. I was a gap” (267). Greatness is elsewhere. There is a plane of greatness – a standard – different from the one we see. Greatness is in conquering what is inner, not what is outer. 2) The second great thing is Orual’s redemption from hatred and contempt of the gods to seeing their beauty and goodness. This is of course related to the mega-theme of false love, but it is more general. Orual’s false love is the thing in her life which needs redeeming, but the process and experience of that redemption can be understood by those who have never experienced the destruction of possessive love. Book I begins and ends with hatred of the gods. What makes the end of the book – her redemption – so powerful is how plausible, how real, how normal, how apparently justified this hatred is throughout the novel. You really feel for her, and understand something of her anguish. In fact, in a 1955 letter to Christian Hardie, Lewis revealed that he had been thinking about this myth for 35 years, and that in his pre-Christian days he had actually imagined Orual in the right and the gods in the wrong. One gets a very authentic sense of what an unredeemed enmity towards God can feel like; how justified it can feel. For that is how deceptive false love operates: it feels virtuous and sacrificial. One who loves in this way usually feels heroic for doing so and would never guess that the truth could be otherwise. This is the great truth that I found so powerful on my first reading of the novel: Orual’s transformation from accusation and indignation and self-justification to self-awareness, repentance, worship, real love, and joy. That last chapter is filled with it. How do you describe this process? How do you describe self-discovery, coming to see who you really are for the first time? How do you describe when an alien force invades your life and shows you things about yourself you never dreamed were true? But they are true! Truer than anything that you have ever believed. Theologically, I call it conviction of sin by the Holy Spirit. But there are no words for the experience of it. When you go down into the depths of your depravity, when you learn to see things inside yourself you never imagined could be there – not in a creepy way, but in a way almost joyful and cleansing – when everything is reversed and what you perceived to be your greatest virtues you now see as shameful things to be repented of – and yet – there is joy in the repentance? What I am seeing is that there is a difference between believing in depravity and redemption and experiencing them. “I saw well why the gods do not speak openly to us, nor let us answer. Till that word can be dug out of us, why should they hear the babble that we think we mean? How can they meet us face to face till we have faces?” (294). “I ended my first book with the words no answer. I know now, Lord, why you utter no answer. You are yourself the answer. Before your face questions die away. What other answer would suffice? Only words, words; to be led out to battle against other words” (308). One final point. 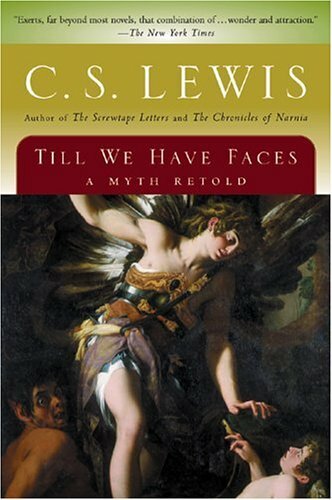 Lewis sometimes gets accused by conservative Christians of polytheism and “myth-dabbling” for identifying the redemptive agents in the story with “the gods.” I think these criticisms are misguided: Lewis chose the myth of Cupid and Psyche as the context in which to tell his tale because it was fitting for making his point about the dangers of false love, and so within the world of this myth beauty and redemption penetrate. But Lewis was not suggesting that the myth-world was itself the true one, any more than Jesus was advocating that there is real communication between those in hell and those in heaven in his parable about the rich man and Lazarus in Luke 16:19-31. Myths, like parables, can be garbed with what Tolkien would call “fictional metaphysics” in order to make a point. Reading this was very enjoyable! You have pointed out some things that I had seen, but had trouble articulating. Thank you! This is my favourite book too, and I have revisited it many times over the years. Every time there was something new I learnt about the world and myself! You have put very well into words this amazing journey of discovery. The only point I would like to add is this, that even when one is confronted by the ugliness of one’s ego-self, the self that only knows how to take, the power of Love is there to wash us clean and change our “faces”, our, identity.. Thank you very much for this article…I mean it was much better than many academic works I have read about my favourite book..this was clear, deep and pointing out the most important practical and life-changing issues from the book..
Something I read recently about the book stated that Lewis, for a long time, wanted to write this story, even before he was a Christian. I always think of the Orual becoming a symbol by hiding behind her mask. It is something he talks a little bit about in the novel. The mask allows people to believe as they wish about her appearance. Many begin to believe Orual is a beautiful woman behind the veil. Her humanity is stripped away by the veil. I think that is why her ability to love is so affected. It isn’t until she removes the veil and stands naked before the gods that she truly brings her humanity back. I think this might be the meaning of the novel. We hide so much behind things, whether it is money, fame, items, even people. We need to strip away our masks to truly interact with God. Yes, I, too, see the love theme in this novel. It’s unfortunate, though, that the story is bogged down by innumerable side issues which, in the end, prove not to advance the story one iota. I finished the novel only because I got so far into it that not finishing would have been a travesty to me. I did not enjoy it at all. If I am to be taught a life lesson, I do not want to travel on all the side roads to get to the point. What a great review of the text. This is truly one of my favorite books and you have articulated some of the poignant truths very well! Thank you for such an insightful view of the book. I, too, find myself drowning in an ocean every time I read the last couple chapters. SO much to unpack there and I get more truth out of it every time I read it! Because he is truth…….Pilate was looking at and talking to ‘truth’. THIS IS SO GOOD!! Thank you. Thank you – I’ve just finished the book and you make some very helpful observations. I wonder if you have heard Peter Kreeft’s lecture available on his website as an mp3 (better than the youtube lecture): he compares Orual’s words to the gods to Job before the Lord and sees Psyche’s experience as a pre-Christian anticipation of the Gospel (while the Fox is the Stoic Greek rationalist – not a Platonist). 2+2 =4-1 =3 QUICK MATHS.